We’ve all been privy to falling down the rabbit hole that is Pinterest. The social platform is a constantly revolving feed of images that inspire us to the fullest, providing ample ideas for quite literally anything and everything one could want in life. That said, there are always the stand-out images that appeal to a slew of pinners across the globe, imparting us with a major dose of inspiration. Since we’re no exception to the addictive nature of Pinterest, we do our fair share of pinning ourselves. As we looked back at the images that dominated our feed last month, we noticed one particular trend: can you tell what it is? Hint, it has a little something to do with organization. Read on to find out. Laura Lane and Nic Rad’s Brooklyn home proved to be a treasure trove of unexpected moments fueled by pops of color, an art display that spanned from wall to wall, and even a room designated for their ultra cute pup, Samo. But the one moment that had us hooked? 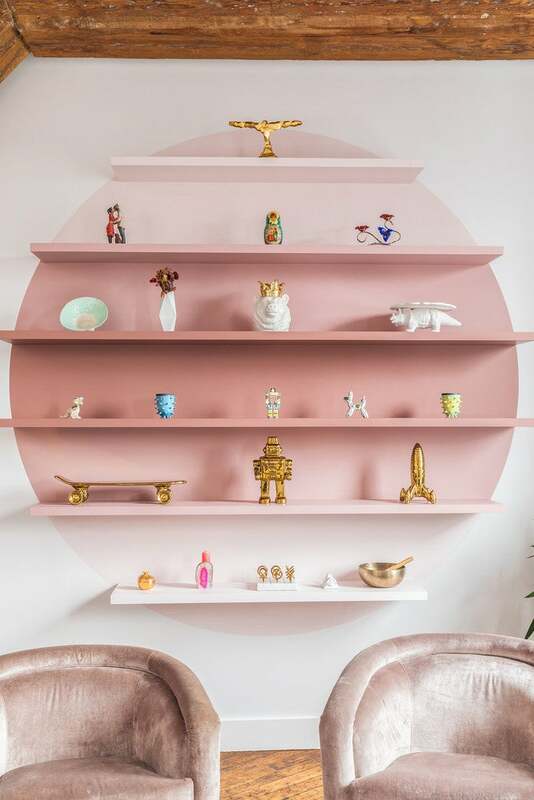 The pink ombre shelf—inspired by neighborhood hotspot, Mociun— that instantly transformed into the focal point of the joint living-dining space. Utilized as a spot that houses a curated scope of found objects and lustrous decorative accessories, the unique shelving unit is seriously envy-worthy. There is nothing new or revolutionary about color-coded bookshelves but, every time we come across one, it further instills us with a major dose of envy. Two for two with their style-focused approach to shelving, Laura Lane and Nic Rad struck gold yet again, with their vibrant display set against a more untraditional backdrop: matte black paint with shelves that match. Keeping in line with the idea that the bedroom should function as a serene and calming oasis—you know, to help you get the best night’s sleep—it’s important to keep the space free of clutter. Shelves may seem like the obvious choice but we rarely find ourselves inclined to bring one into the bedroom. A lack of space is one reason for it, the inevitable clutter that comes with is another. Hence why a built-in unit that comes complete with a door (is that genius, or what?) is definitely the way to go. We’re taking major cues from this Toronto home, which comes with a cleverly-concealed, built-in storage solution that conveniently and seamlessly disappears into the wall. You’ve proven your love for pantries and well-organized spaces so, it came as no surprise that this immaculately-styled linen closet was on the list of the most-pinned images last month. With a designated spot for just about every essential—toilet paper, pillows, the works, really—this spot is seriously speaking to the inner neat freak in us all. Built-in units are sweeping the trends as of late and it’s easy to see why: elegant, timeless, and essentially space-saving, they have the ability to instantly elevate just about any room. In this cozy living room, the built-in unit doubles as a media wall, encompassing everything from the television to the entertaining nook, complete with a solid bar setup. Don’t have a built-in in your existing space? Here’s how to hack one.